Britain is a nation of gardeners; I’ve heard that 80% of houses in Britain have private gardens, covering an area twice as large as Surrey. That’s fifteen million gardens in our green and pleasant land. Every weekend sees thousands of us making our way to garden centres, where we choose plants, bulbs, seeds and sundries to try to make our garden beautiful. Slugs, aphids and caterpillars eat most of them, but gardeners are a tolerant bunch – it’s not just the plants, it’s the general feeling of well-being and of feeling at one with nature which urges us to plunge our hands into the soil to embed yet another plant into the ground. Some of us build conservatories, or maybe garden shelters, so that we can use the garden as an extension of our homes even when the weather is inclement. We dot ornaments around the flower beds, nesting boxes and insect homes along the garden walls and we build ponds and fountains so birds can bathe. When we dine in the garden, we use floral plates, butterfly-decorated glasses, flowery cutlery – and all these things can be deemed collectable, whether you use vintage pieces or go for modern or retro designs. Even if you don’t have a garden, you can still create a garden feel indoors by collecting items with a floral or naturalistic theme. I’ve known people who have created an indoor garden by displaying pretty flowered plates against white wall-mounted trellis and hanging a few indoor plants to enhance the effect. Another way of ‘garden collecting’ is to collect old gardening items, from tools to seed packets, and from statues to lawnmowers. The most obvious choice for garden collectables is probably the well-known ‘Botanic Garden’ range of tableware made by Portmeirion pottery. 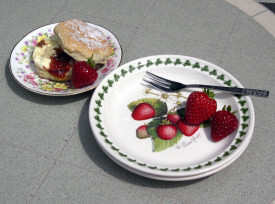 Portmeirion, though, have produced many other beautiful designs which would look stunning at an alfresco meal. One of my personal favourites is the ‘British Birds’ design, based on illustrations from the Natural History of British Birds by Edward Donovan, published in 1794. Forty birds were featured in the collection, and because the designs are in a antiquated style the pieces have a timeless quality about them, which is probably why they have remained in production for so long. This pattern was originally conceived in 1974, and sadly is not now sold in Britain, though is still available in America. I acquired my items in the 1980s when visiting the shop in Portmeirion village, but pieces do crop up at collector’s fairs. 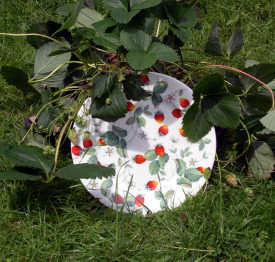 I’m also very fond of the ‘Strawberry Fair’ decoration – perfect for serving scones on a summer’s day – and the ‘Pomona’ design of varieties of fruits. There are many other Portmeirion designs with a ‘garden’ theme, amongst them the recent ‘Hungry Caterpillar’ which is based on the popular picture book by Eric Carle. Incidentally, if you are visiting North Wales, do try to visit the village of Portmeirion. The pottery isn’t made there, though there is a shop selling the current range – but the village is stunningly quirky. It’s as though a slice of a sleepy Italian village has been deposited on a beautiful stretch of Welsh coastline; it’s a restful place and one of my all-time special spots. 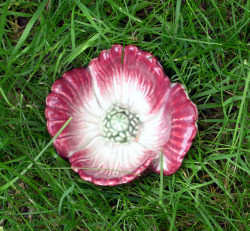 Many ranges of tableware from the 1960s and 70s employed the flower motif – these were the days of flower power. Think Meakin, for the delicate pink floral ‘Filigree’ design, or the more bold ‘Poppy’, while ‘Topic’, with its blue stylised flowers is classic 60s elegance. Even more stylised is the swirling 1960s ‘Spanish Garden’ from Midwinter, while their ‘Country Garden’, with its pattern of leaves and buds symmetrically curling from either side of a large blue and pink flower, is beautiful. It would be impossible to mention all the floral ranges – practically every manufacturer of tableware has included a floral design at one time – but they range from delicate chintz type patterns to vibrant, bold roses. Floral china is perfect for a meal in the garden on a summer’s day, and can be themed with pretty cutlery, such as the 1960s’ Viner’s ‘Love Story’ which bears a design of tiny silver daisies. Don’t forget glasses; there are plenty of beautiful designs to look out for, both vintage and modern, featuring flowers, leaves or butterflies. You could look out for a suitable vintage tablecloth, too – ‘lazy daisy’ stitch was very popular in the 1930s, 40s and 50s and will complement your garden theme. 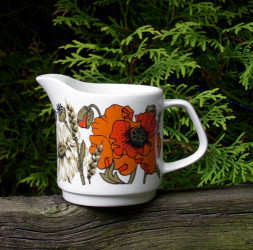 If you’re worried about risking your treasured china in the garden, then there are plenty of modern plastic pieces around – and some, such as the gorgeous retro sixties floral designs which Asda came up not so long ago, might even become future classics! As well as tablecloths, other fabric items can be used outside including cushions, throws and canopies; look out for vintage patterns, such as the large-flowered round-petalled daisy types from the 1960s and the bold flowered orange and deep green 1970s’ designs. It’s best, though, to bring them in at night as they could get damp, and also not to keep them in the sunlight for too long, in case they fade. Floral handbags and scarves, or wicker shopping baskets and hampers look good artlessly dotted around at a garden party or a get-together. They add an element of fun, and are a great way of displaying a collection of traditional or retro items. I’m a Simon Drew fan – he is an artist with a quirky sense of humour. He’s based at Dartmouth where he has a shop and gallery, and many of his designs are based on puns such as a ‘receding hare’ or ‘joined up whiting’. Some of his garden themes, including ‘Incapability Brown’ have been featured in a range of ‘bug proof’ mugs. They come with a ceramic lid so that there is no danger of a stray caterpillar or fly falling into your drink as you relax in your garden. Other Drew designs feature animal puns. Similar lidded mugs can be found in the Alan Titchmarsh range of collectables, as well as other items such as a gardening-themed radio, perfect for the gardener who wants to catch up with his favourite radio show while he’s planting his pansies. Many people collect old gardening tools. There is something spiritual about a trowel or spade which has been used to turn the soil for decades – it has worked through so many seedtimes and harvests, and garden-worn hands will have rubbed the handle smooth. The majority of tools have changed little from when they were first invented centuries ago, while some items, such as dibbers, are made nowadays from beautiful polished wood, or from old bobbins, and are becoming a collectable item in their own right. Have you ever thought of collecting seed packets? A visit to any plant establishment will reveal hundreds of brightly coloured packets, and a selection of these (plant the contents first!) mounted and framed, will bring the garden indoors even in the depths of winter. Some of the vintage seed packets are particularly beautiful, and they are the kind of item you might discover at a boot fair. Another idea is to look out for old chimney pots. These might seem rather odd garden collectables but many bear intricate patterns and mouldings, and they can be adapted for use as plant containers. Some people concentrate on children’s gardening toys – miniature wheelbarrows, watering cans and tools. In the grounds of Osborne House on the Isle of Wight is a miniature Swiss cottage with gardens attached, and these were once tended by the children of Queen Victoria and Prince Albert. The miniature tools the children used can still be seen. Other small gardening collectables include the miniature garden sets created by the company of William Britain, which was originally founded in 1893. Renowned for its models of lead animals, military figures and vehicles, the company later went on to make a delightful range called ‘Miniature Gardening’, which was aimed at girls. This detailed series with flowerbeds, walling, lily pond, paving and a greenhouse is delightful and can sometimes be found at antiques fairs. Back to modern items for a moment; gardening shops frequently stock a range of metal watering cans shaped like birds and animals, and I’ve seen these in Natural Trust shops too. Not for the serious gardener as they only hold a litre or so of water, these are basically decorative, though are useful for watering pot plants. The designs include a frog, chick, snail, goose and even a sheep. These watering cans are attractive enough to be used inside, displayed with your indoor plants, as well as making a focal point on a patio. Nowadays garden centres are full of statues and ornaments, and it’s true that most of them are of the twee plastic gnomes and bunnies type – but not all. Vintage garden sculptures can sell for hundreds or even thousands of pounds, but attractive modern pieces can still be found for a few pounds, and they will soon weather in to become almost indistinguishable from the real McCoy. In fact, you can help the weathering process by coating your concrete or resin ornaments with yoghurt, which will soon encourage moss and lichen to grow. In a year or two, your garden centre buy will look as though it has stood in your garden for ever – and who knows? Maybe it will eventually become so sought after, that it will sell for vast sums too! Of course, just because you collect garden-related items it doesn’t mean that they must be kept out of doors. Thousands upon thousands of flora and fauna items can be enjoyed all the year round. If you are looking for something elegant, then maybe you would like pieces of Russian porcelain. Made by factories such as Lomonosov, which was founded during the reign of Peter the Great in 1744, this smooth and tactile porcelain is very bea utiful. 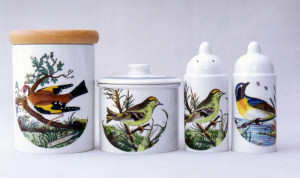 Bird designs include a delightful waxwing, a wren, a magpie and a lapwing. I’m a fan of wooden carvings, and wood seems to lend itself well to birds, the grain mimics the appearance of plumage. Some woodcarvings can be used to decorate the garden, but over time they will rot. I prefer to keep mine indoors where I can see them whatever the weather, as I do with those modern zany metal and wire sculptures which adorn so many gift shops. I love those sculptures, they look great in the garden but also make an unusual feature on a sideboard – will they become collectable? Only time will tell. I enjoy them because they appeal to my sense of humour. So, don’t overlook the garden theme when it comes to seeking out collectables; whether you prefer vintage, modern or retro, there is an enormous bouquet of goodies to be found, with prices to suit all pockets.